2012 Mercedes E300 Bluetec Hybrid review | What Car? The 2012 Mercedes-Benz E300 Bluetec Hybrid is based on the E-Class executive car, and is the companys first diesel-electric model. 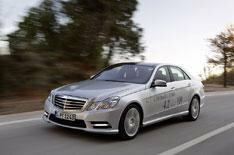 It combines the 2.1-litre engine from the E250 CDI with a small electric motor and a seven-speed automatic gearbox. The result: average economy of 67.2mpg and CO2 emissions of just 109g/km. To put that into perspective, the E250 CDI can manage only 54.3mpg and 136g/km. We tried a saloon version of the E300, but an estate will be offered as well. Whats the 2012 E300 Bluetec Hybrid like to drive? If you tread lightly on the accelerator, the E300 can run on electric power alone for short periods. Alternatively, put your foot down hard, and the electric motor assists the engine, ensuring strong performance. When its revved hard like this, the engine sounds gruff. However, most of the time its far quieter than it is in other Mercedes models. The transition between diesel and electric power is generally pretty smooth. The exception is when you ask for a sudden burst of pace while coasting in electric mode; the engine is slow to respond, and when it does, you feel a jolt. Our test car came on 18-inch alloys, which wed avoid, because they bring a firm edge to the ride. Youre much better off sticking with the standard wheels and one of the softer suspension options as with other E-Class models, the hybrid will be offered with a choice of set-ups. The E300 feels extremely stable on the motorway, and wind- and road noise are kept to a minimum at all times. Whats the 2012 E300 Bluetec Hybrid like inside? Aside from a couple of readouts on the dashboard that show how the hybrid system is working, it looks like any other E-Class from behind the wheel. The dashboard falls a little short of the class-leading BMW 5 Series in terms of perceived quality and ease of use. However, the driving seat moves electrically and theres a huge range of adjustment, so youll have no trouble finding a comfortable position. The rear is equally impressive, with space for a couple of six-footers. Whats more, Mercedes has managed to fit the electric motor's batteries under the bonnet, so they dont eat into the boot space as they do in many hybrids. That depends on the price, which is still to be confirmed. However, if Mercedes can keep it below 40,000, the E300 will be seriously tempting as a company car, because its a big and cosseting saloon with impressive fuel consumption and CO2 figures. Even BMW's brilliant 520d Efficient Dynamics looks inefficient by comparison, let alone petrol-electric hybrids such as the Active Hybrid 5.